Can the centre of mass of a body be at a point outside the body? Yes, the centre of mass can be at a point outside the body. For example, the centre of mass of a ring lies at its centre, which is not a part of the ring. If all the particles of a system lie in X-Y plane, is it necessary that the centre of mass be in X-Y plane? Yes, if all the particles of a system lie in the X–Y plane, then it’s necessary that its centre of mass lies in the X–Y plane. zcm=m1z1+m2z2+…mnzn∑mAs all the particles lie in the X–Y plane, their z-coordinates are zero. Therefore, for the whole system, zcm = 0; i.e., its centre of mass lies in the X–Y plane. If all the particle of a system lie in a cube, is it necessary that the centre of mass be in the cube? Yes. As a cube is a 3-dimensional body, all the particles of a system lying in a cube lie in the x,y and z plane. Let the ith element of mass âˆ†mi is located at the point (xi,yi,zi). X=1M∑i=1i=n∆mixiY=1M∑i=1i=n∆miyiZ=1M∑i=1i=n∆miziX, Y and Z lie inside the cube because it is a weighted mean. r→iand Q is the total charge of the system. (a) Can the centre of charge of a two-charge system be outside the line segment joining the charges? (b) If all the charges of a system are in X-Y plane, is it necessary that the centre of charge be in X-Y plane? (c) If all the charges of a system lie in a cube, is it necessary that the centre of charge be in the cube? Consider a charge distributed in X-Y plane. Xcm=-6q×0+q×5a-6q+q=-a(b) Yes. Because the z-coordinates of all the charges are zero, the centre of charge lies in X-Y plane. (c) No, it is not necessary that the centre of charge lies in the cube because charge can be either negative or positive. The weight Mg of an extended body is generally shown in a diagram to act through the centre of mass. Does it mean that the earth does not attract other particles? In order to simplify the situation, we consider that the weight Mg of an extended body acts through its centre of mass. Although the earth attracts all the particles, the net effect can be assumed to be at the centre of mass. A bob suspended from the ceiling of a car which is accelerating on a horizontal road. The bob stays at rest with respect to the car with the string making an angle θ with the vertical. The linear momentum of the bob as seen from the road is increasing with time. Is it a violation of conservation of linear momentum? If not, where is the external force changes the linear momentum? There is no violation of conservation of momentum because in the earth’s frame the component of tension is acting in the horizontal direction. You are waiting for a train on a railway platform. Your three-year-old niece is standing on your iron trunk containing the luggage. Why does the trunk not recoil as she jumps off on the platform? The trunk does not recoil as the girl jumps off on the platform because the force exerted by the girl is less than the limiting friction between the platform and the iron trunk. In a head-on collision between two particles, is it necessary that the particles will acquire a common velocity at least for one instant? For example, consider particle-1 at a velocity of 4 ms-1 and particle-2 at a velocity of 2 ms-1 undergo a head-on collision. The velocity of particle-1 decreases but particle-2 increases. Therefore, at an instant, their velocities will be equal. A collision experiment is done on a horizontal table kept in an elevator. Do you expect a change in the result if the elevator is accelerated up or down because of the noninertial character of the frame? No. As the collision experiment is being done on a horizontal table in the elevator that is accelerating up or down in vertical direction, no extra force is experienced in the horizontal direction. Hence, the objects in the horizontal direction remain unaffected. Two bodies make an elastic head-on collision on a smooth horizontal table kept in a car. Do you expect a change in the result if the car is accelerated in a horizontal road because of the non inertial character of the frame? Does the equation “Velocity of separation = Velocity of approach” remain valid in an accelerating car? Does the equation “final momentum = initial momentum” remain valid in the accelerating car? No, due to the non-inertial character of the frame and the presence of a pseudo force, both the equations, i.e., Velocity of separation = Velocity of approach and Final momentum = Initial momentum, do not remain valid in the accelerating car. If the total mechanical energy of a particle is zero, is its linear momentum necessarily zero? Is it necessarily nonzero? No. As the potential energy can have a negative value, the total energy of the system may sum up to zero. Two masses A and B having masses 2 kg and 4 kg respectively move with a velocity of 4 ms-1 in opposite directions. =12×2×42 +12×4×42 =48 JIf the gravitational potential energy of the system is −48 J, the total energy of the system will be zero. However, the linear momentum will be non-zero. If the linear momentum of a particle is known, can you find its kinetic energy? If the kinetic energy of a particle is know can you find its linear momentum? Yes, the kinetic energy of the particle can be determined if the value of linear momentum is known. K.E=12mv2=p22mwhere, p is the linear momemtum having value mv.But linear momentum cannot be determined even if the kinetic energy is known because linear momentum is a vector quantity, whereas kinetic energy is a scalar quantity. Thus, the direction of the linear momentum remains unknown, however its magnitude can be calculated. What can be said about the centre of mass of a uniform hemisphere without making any calculation? Will its distance from the centre be more than r/2 or less than r/2? The distance of centre of mass of a uniform hemisphere from its centre will be less than r/2 because the portion of the hemisphere lying below r/2 from the diameter is heavier than the portion lying above r/2. You are holding a cage containing a bird. Do you have to make less effort if the bird flies from its position in the cage and manages to stay in the middle without touching the walls of the cage? Does it makes a difference whether the cage is completely closed or it has rods to let air pass? More effort is needed when the cage is closed, while less effort is required when the cage has rods to let the air pass. When a bird flies from its position, it pushes the air downwards. Thus, when the bird is in a cage, the net downward force will be equal to the weight of the cage plus the downward force due to air (the weight of the bird). However, if the cage has rods to let air pass, the downward force exerted by air become less. Therefore, less effort will be required to hold the cage. A fat person is standing on a light plank floating on a calm lake. The person walks from one end to the other on the plank. His friend sitting on the shore watches him and finds that the person hardly moves any distance because the plank moves backward about the same distance as the person moves on the plank. Explain. According to the question, the weight of plank is very less as compared to the fat person. Therefore, the centre of mass of the whole system effectively lies on the person. As the net external force on the system is zero, the centre of mass of the system does not move. A high-jumper successfully clears the bar. Is it possible that his centre of mass crossed the bar from below it? Try it with appropriate figures. From the figure, it can be seen that when a high-jumper successfully clears the bar, it is possible that her centre of mass crosses the bar from below it because the legs as well as the arms of the high-jumper are below the bar. Hence, the point shown in the figure can be her centre of mass. Which of the two persons shown in figure is more likely to fall down? Which external force is responsible for his falling down? The person shown on the right hand side of the figure is more likely to fall down because in the given cart frame the pseudo force will be in backward direction. Suppose we define a quantity ‘Linear momentum’ as linear momentum = mass × speed. The linear momentum of a system of particles is the sum of linear momenta of the individual particles. Can we state principle of conservation of linear momentum as “linear momentum of a system remains constant if no external force acts on it”? It is not necessary that the linear momentum of a system remains constant even if no external force acts on it because during collision, the sum of magnitudes of momenta does not remain constant. Use the definition of linear momentum from the previous question. Can we state the principle of conservation of linear momentum for a single particle? Yes, if the external force applied on the particle is zero, its speed does not change and hence, the momentum remains constant. To accelerate a car we ignite petrol in the engine of the car. Since only an external force can accelerate the centre of mass, is it proper to say that “the force generated by the engine accelerates the car”? Yes, it’s proper to say that the force generated by the engine accelerates the car. When petrol burns inside the engine, the piston moves, which in turn rotates the wheel. As the wheel rotates, the frictional forces from the road moves the car. A ball is moved on a horizontal table with some velocity. The ball stops after moving some distance. Which external force is responsible for the change in the momentum of the ball? The frictional force acting between the surface of the table and the ball is responsible for the change in momentum of the ball. As the force opposes the motion of the ball, it stops after moving some distance. Consider the situation of the previous problem. Take “the table plus the ball” as the system. friction between the table and the ball is then an internal force. As the ball slows down, the momentum of the system decreases. Which external force is responsible for this change in the momentum? Considering the table plus the ball as a system, it can be said that the frictional force is responsible for the change in the momentum. As the force acts between the surface of the table and ground, it opposes the motion of the table plus the ball. Hence, the ball slows down and the momentum of the system decreases. When a nucleus at rest emits a beta particle, it is found that the velocities of the recoiling nucleus and the beta particle are not along the same straight line. How can this be possible in view of the principle of conservation of momentum? In view of the principle of conservation of momentum, the given situation is possible because as a beta particle is ejected, another particle called an antineutrino is also ejected. A van is standing on a frictionless portion of a horizontal road. To start the engine, the vehicle must be set in motion in the forward direction. How can be persons sitting inside the van do it without coming out and pushing from behind? According to the question, the van is standing on a frictionless surface. When throwing something in backward direction, the persons sitting inside the van sets the van in motion in the forward direction according to the principle of conservation of linear momentum. In one-dimensional elastic collision of equal masses, the velocities are interchanged. Can velocities in a one-dimensional collision be interchanged if the masses are not equal? No. If the masses are different, the velocities in a one-dimensional collision cannot be interchanged because that would be violation of the principle of conservation of momentum. (d) B is correct but A is wrong. In a non-inertial frame, the position of centre of mass of the particle does not change but an additional pseudo force acts on it. (A) Linear momentum of the system remains constant. (B) Centre of mass of the system remains at rest. (a) A implies B and B implies A. (b) A does not imply B and B does not imply A. (c) A implies B but B does not imply A. (d) B implies A but A does not imply B. 1M∑midr→idt=0∑miv→i=0This implies that the linear momentum of the system remains constant. (A) Linear momentum of a system of particles is zero. (B) Kinetic energy of a system of particles is zero. K.E.≠0i.e. A does not imply B.
P→= mv→1 + mv→2taking v1=-v2, we can write:P→= 0Hence, we can say, B implies A but A does not imply B. (A) The linear momentum of a particle is independent of the frame of reference. (B) The kinetic energy of a particle is independent of the frame of reference. As the velocity of the particle depends on the frame of reference, the linear momentum as well as the kinetic energy is dependent on the frame of reference. R’ = 1M∑i=1nmir→iLet half of the particles lie on +Y-axis and the rest of the particles lie on +X-axis. In general, R’ ≤ R.
Let m1 be the mass of circular plate and m2 be the mass of square plate. The thickness of both the plates is t.
mass = density × volumem1 = ρπd22t m2 = ρd2tCentre of mass of the circular plate lies at its centre. Let the centre of circular plate be the origin. r→1=0Centre of mass of the square plate lies at its centre. r→2=2dNow,R = m1r→1 + m2r→2m1 + m2 = m1 × 0 + ρd2t × 2dρπd22t + ρd2t = 2dπ4 + 1 = 1.12d⇒R>d ∴Centre of mass of the system lies in the square plate. Internal forces can not change the position of centre of mass of a system. Therefore, linear momentum of the system is constant, whereas kinetic energy of the system is not. A bullet hits a block kept at rest on a smooth horizontal surface and gets embedded into it. Which of the following does not change? (d) temperature of the block. When the block kept at rest is hit by a bullet, the block acquires certain velocity by the conservation of linear momentum. Therefore, the linear momentum and the kinetic energy of the block change. As some of the kinetic energy carried by the bullet transforms into heat energy, its temperature also changes. However, the gravitational potential energy of the block does not change, as the height of the block does not change in this process. (d) is independent of h.
As the uniform sphere is placed on a smooth surface, the sphere only slips. Applied force Mass of the sphere,which is independent of height h.
(d) depends on the vertical velocity at the time of breaking. As the body falls vertically downwards, no external force acts in the horizontal direction. Hence, the centre of mass does not shift horizontally. (d) of the ball relative to the box remains constant. Consider the box and the ball a system. As no external force acts on this system, the velocity of the centre of mass of the system remains constant. (d) in opposite directions with unequal speeds. ⇒M × 0 = M2v1 + M2v2⇒v1 = -v2where M is the initial mass of the body, at rest. 2mv2rmust be acting on the ring. (d) momentum, but neither kinetic energy nor temperature. Linear momentum of a system remains constant in a collision. However, the kinetic energy and temperature of the system may vary, as their values depend on the type of collision. v→emits an α-particle. Let the velocities of the α-particle and the remaining nucleus be v1 and v2 and their masses be m1 and m2. v→,v→1 and v→2must be parallel to each other. v→,v→1 and v→2should be parallel to each other. The linear momentum is conserved in horizontal direction. (d) the kinetic energy first increases then decreases. As no energy is lost into heat in an elastic collision, the initial kinetic energy is equal to the final kinetic energy. As some energy is loss into heat in an inelastic collision, the final kinetic energy is less than the initial kinetic energy. The centre of mass of a system of particles depends on the product of individual masses and their distances from the origin. (a) Distance of particles from origin is not known. (b) Masses are same but the distance of particles from the origin is not given. (c) Distance of particles from origin is not given. (d) It is not necessary that least one particle lies on the negative X-axis. The particles can be above the negative X-axis on X-Y plane. Three particles of masses 1.0 kg, 2.0 kg and 3.0 kg are placed at the corners A, B and C respectively of an equilateral triangle ABC of edge 1 m. Locate the centre of mass of the system. The structure of a water molecule is shown in figure. Find the distance of the centre of mass of the molecule from the centre of the oxygen atom. Let OX be the x-axis, OY be the Y-axis and O be the origin. Mass of O atom, m1= 16 unitLet the position of oxygen atom be origin. Seven homogeneous bricks, each of length L, are arranged as shown in figure. Each brick is displaced with respect to the one in contact by L/10. Find the x-coordinate fo the centre of mass relative to the origin shown. Let OX be the X-axis and point O (0, 0) be the origin of the system. The mass of each brick is M.
The length of each brick is L.
A uniform disc of radius R is put over another uniform disc of radius 2R of the same thickness and density. The peripheries of the two discs touch each other. Locate the centre of mass of the system. Let the centre O (0, 0) of the bigger disc be the origin. ρ is the density of the two discs. R5from the centre of bigger disc, towards the centre of smaller disc. (d) may be positive for some cases and negative in other cases. According to the question, the centre of mass is at origin. ⇒m1x1 + m2x2 + m3x3 +… = 0From the above equation, it can be concluded that all the x-coordinates may be non-negative. In other words, they may be positive for some cases and negative for others. In which of the following cases the centre of mass of a rod is certainly not at its centre? (d) the density increases from left to right upto the centre and then decreases. As the density continuously increases/decreases from left to right, there will be difference in the masses of rod that lie on either sides of the centre of mass. Thus, the centre of mass of a rod in such a case will certainly not be at its centre. However, it may move uniformly with constant velocity. If a non-zero external force acts on a system of particles, it causes the centre of mass of the system to accelerate with acceleration a0 at any instant t. In such a case, the velocity of centre of mass of the system of particles is either v0 or zero. (d) is equal to g.
As no external force acts on the block, the linear momentum is conserved. Some energy is used to break the block, thus the total kinetic energy must change. (d) the final linear momentum is equal to the initial linear momentum. During an elastic collision, all of the above statements are valid. As the ball rebounds after hitting the floor, its velocity changes. Therefore, the momentum of the ball just after the collision is not same as that just before the collision. The mechanical energy of the ball also changes during the collision. However, the total momentum of the system (earth plus ball) and the total energy of the system remain conserved. (d) the stationary body remains stationary, the moving body changes its velocity. ⇒pi = pf⇒m1u = m1v1 + m2v2⇒v1 = v2 ≠ 0However, it may be possible that v1 becomes 0 and v2 becomes m1um2. (d) the faster body slows down and the slower body speeds up. A disc of radius R is cut out from a larger disc of radius 2R in such a way that the edge of the hole touches the edge of the disc. Locate the centre of mass of the residual disc. Let O be the origin of the system (smaller disc plus bigger disc). The density of the rods is ρ. The thickness of rods is T.
m2 be the mass and 2R be the radius of the bigger disc. According to the question, the smaller disc is cut out from the bigger disc. R3from the centre of bigger disc, away from centre of the hole. A square plate of edge d and a circular disc of diameter d are placed touching each other at the midpoint of an edge of the plate as shown in figure. Locate the centre of mass of the combination, assuming same mass per unit area for the two plates. Let m be the mass per unit area of the square plate and the circular disc. πd24mLet the centre of the circular disc be the origin of the system. 4d(π+4)from the centre of circular disc, towards right. Calculate the velocity of the centre of mass of the system of particles shown in figure. Vcm is 0.20 m/s , at 45° below the direction, towards right. Two blocks of masses 10 kg and 20 kg are placed on the X-axis. The first mass is moved on the axis by a distance of 2 cm. By what distance should the second mass be moved to keep the position of the centre of mass unchanged? Let the two masses m1 and m2 be placed on the X-axis. The first mass is displaced by a distance of 2 cm. ⇒0=20+20×230⇒ 20+20×2=0⇒20=-20×2⇒x2=-1Therefore, to keep the position of centre of mass unchanged, the block of mass 20 kg should be moved by a distance of 1 cm, towards left. Two blocks of masses 10 kg and 30 kg are placed along a vertical line. The first block is raised through a height of 7 cm. By what distance should the second mass be moved to raise the centre of mass by 1 cm? Let the two masses m1 and m2 are kept along a vertical line. First block is raised through a height of 7 cm. Ycm= m1y1 + m2y2m1 + m2⇒1= 10 × 7 + 30 × y240⇒70+30y2 = 40⇒30y2 = -30⇒y2 = -1Therefore, the 30 kg block (m2) should be moved by 1 cm downwards in order to raise the centre of mass by 1 cm. Consider a gravity-free hall in which a tray of mass M, carrying a cubical block of ice of mass m and edge L, is at rest in the middle. If the ice melts, by what distance does the centre of mass of “the tray plus the ice” system descend? As there is no gravity or other external forces acting on the system, the melting ice tends to acquire a spherical shape. Therefore, the centre of mass of the system does not move. Find the centre of mass of a uniform plate having semicircular inner and outer boundaries of radii R1 and R2. Let the mass of the plate be M.
Consider a small semicircular portion of mass dm and radius r, as shown in fig. Mr. Verma (50 kg) and Mr. Mathur (60 kg) are sitting at the two extremes of a 4 m long boat (40 kg) standing still in water. To discuss a mechanics problem, they come to the middle of the boat. Neglecting friction with water, how far does the boat move on the water during the process? Let A be the origin of the system (boat plus two men). Initially, Mr. Verma and Mr. Mathur were at two extremes of the boat. Xcm=m1×x1 + m2×x2 + m3×x3m1 + m2 + m3 =60×0 + 50×4 + 40×260 + 50 + 40 =280150=1.87 m from AAs no external force is experienced in longitudinal direction, the centre of mass would not shift. Initially, the centre of mass lies at a distance of 2 m from A. When the men move towards the middle of the boat, the centre of mass shifts and lies at 1.87 m from A. Hence, the boat moves 13 cm or 0.13 m towards right. A car of mass M is at rest on a frictionless horizontal surface and a pendulum bob of mass m hangs from the roof of the cart. The string breaks, the bob falls on the floor, makes serval collisions on the floor and finally lands up in a small slot made in the floor. The horizontal distance between the string and the slot is L. Find the displacement of the cart during this process. The mass of the bob is m.
The mass of the cart is M.
Considering the bob falls at point A. When the bob falls in the slot, the distance of centre of mass of the system from P becomes zero. The balloon, the light rope and the monkey shown in figure are at rest in the air. If the monkey reaches the top of the rope, by what distance does the balloon descend? Mass of the balloon = M, mass of the monkey = m and the length of the rope ascended by the monkey = L.
The mass of monkey is m.
The mass of balloon is M.
Initially, the monkey, balloon and the rope are at rest. Let the centre of mass is at a point P.
The centre of mass shifts. Find the ratio of the linear momenta of two particles of masses 1.0 kg and 4.0 kg if their kinetic energies are equal. Let the masses of the two particles be m1 and m2. 12m1v12 = 12m2v22⇒m1m2 = v22v12⇒v2v1 = m1m2⇒v1v2 = m2m1The ratio of linear momenta (mv) of the two particles,P1P2 = m1v1m2v2 = m1m2m2m1 = m1m2 = 14=12⇒P1:P2 = 1:2Therefore, the ratio of linear momenta is 1:2. A uranium-238 nucleus, initially at rest, emits an alpha particle with a speed of 1.4 × 107 m/s. Calculate the recoil speed of the residual nucleus thorium-234. Assume that the mass of a nucleus is proportional to the mass number. According to the question, uranium 238 nucleus emits an alpha-particle with a speed of 1.4 × 107 m/s. Let the speed of the residual nucleus thorium 234 be v2. m1v1=m2v2Here, m1 and v1 are the mass and velocity of the alpha-particle repectively, and m2 is the mass of the residual nucleus. A man of mass 50 kg starts moving on the earth and acquires a speed 1.8 m/s. With what speed does the earth recoil? Mass of earth = 6 × 1024 kg. m1v1=m2v2Here, m1 and v1 are the mass and velocity of the man respectively, and m2 and v2 are the mass and velocity of the Earth respectively. ⇒ 50 × 1.8 = 6 × 1024×v2∴ v2 = 50 × 1.86 × 1024 = 15 × 10-24m/s⇒ v2 = 1.5 × 10-23m/sHence, the earth recoils with a speed of 1.5 × 10−23 m/s. A neutron initially at rest, decays into a proton, an electron and an antineutrino. The ejected electron has a momentum of 1.4 × 10−26 kg-m/s and the antineutrino 6.4 × 10−27 kg-m/s. Find the recoil speed of the proton (a) if the electron and the antineutrino are ejected along the same direction and (b) if they are ejected along perpendicular directions. Mass of the proton = 1.67 × 10−27 kg. Let the recoil speed of the proton be Vp. A man of mass M having a bag of mass m slips from the roof of a tall building of height H and starts falling vertically. When at a height h from the ground, the notices that the ground below him is pretty hard, but there is a pond at a horizontal distance x from the line of fall. In order to save himself he throws the bag horizontally (with respect to himself) in the direction opposite to the pond. Calculate the minimum horizontal velocity imparted to the bag so that the man lands in the water. If the man just succeeds to avoid the hard ground, where will the bag land? Let the man throws the bag towards left with a velocity v and himself moves towards right with a velocity V.
mv = MV⇒v=MVm …(1)Let the total time he takes to reach ground be t1.⇒t1=2HgLet the total time he takes to reach the height h be t2.⇒t2=2(H-h)g∴ The time of flying in covering the remaining height h is, t=t1-t2⇒t=2Hg-2(H-h)g =2gH-H-hDuring this time, the man covers a horizontal distance x and lands in the water. Let the bag lands at a distance x’ towards left from actual line of fall. As there is no external force in horizontal direction, the x-coordinate of the centre of mass will remain same. A ball of mass 50 g moving at a speed of 2.0 m/s strikes a plane surface at an angle of incidence 45°. The ball is reflected by the plane at equal angle of reflection with the same speed. Calculate (a) the magnitude of the change in momentum of the ball (b) the change in the magnitude of the momentum of the ball. P→2-P→1=2×0.5-2×0.5=0i.e. There is no change in magnitude of the momentum of the ball. Light in certain cases may be considered as a stream of particles called photons. Each photon has a linear momentum h/λ where h is the Planck’s constant and λ is the wavelength of the light. A beam of light of wavelength λ is incident on a plane mirror at an angle of incidence θ. Calculate the change in the linear momentum of a photon as the beam is reflected by the mirror. A block at rest explodes into three equal parts. Two parts start moving along X and Y axes respectively with equal speeds of 10 m/s. Find the initial velocity of the third part. As the block is exploded only because of its internal energy, the net external force on the system is zero. Thus, the centre of mass of does not change. Let the body was at the origin of the co-ordinate system during explosion. v=102+102+2.10.10 cos 90°= 102m/s, 45° w.r.t x- axisIf the centre of mass is at rest, the third part having equal mass as that of the other two masses will move in the opposite direction (i.e. Two fat astronauts each of mass 120 kg are travelling in a closed spaceship moving at a speed of 15 km/s in the outer space far removed from all other material objects. The total mass of the spaceship and its contents including the astronauts is 660 kg. If the astronauts do slimming exercise and thereby reduce their masses to 90 kg each, with what velocity will the spaceship move? According to the question, the spaceship is removed from all other material objects and kept totally isolated from the surroundings. Thus, the mass loss by astronauts couldn’t slip away from the spaceship. Therefore, the total mass of the spaceship remains unchanged and so does its velocity. Hence, the spaceship moves with the speed of 15 km/s. During a heavy rain, hailstones of average size 1.0 cm in diameter fall with an average speed of 20 m/s. Suppose 2000 hailstones strike every square meter of a 10 m × 10 m roof perpendicularly in one second and assume that the hailstones do not rebound. Calculate the average force exerted by the falling hailstones on the roof. Density of a hailstone is 900 kg/m3. A ball of mass m is dropped onto a floor from a certain height. The collision is perfectly elastic and the ball rebounds to the same height and again falls. Find the average force exerted by the ball on the floor during a long time interval. It is given that the mass of the ball is m.
Let the ball be dropped from a height h.
The speed of ball before the collision is v1. ∴ v1 = 2ghThe speed of ball after the collision is v2. A railroad car of mass M is at rest on frictionless rails when a man of mass m starts moving on the car towards the engine. If the car recoils with a speed v backward on the rails, with what velocity is the man approaching the engine? The mass of the railroad car is M.
The mass of the man is m.
The car recoils with a speed v, backwards on the rails. Let the man of mass m approaches towards the engine with a velocity v’ w.r.t the engine. ∴ The velocity of man w.r.t earth is v’ − v, towards right. A gun is mounted on a railroad car. The mass of the car, the gun, the shells and the operator is 50 m where m is the mass of one shell. If the velocity of the shell with respect to the gun (in its state before firing) is 200 m/s, what is the recoil speed of the car after the second shot? Neglect friction. Let the speed of car be v.
Two persons each of mass m are standing at the two extremes of a railroad car of mass M resting on a smooth track. The person on left jumps to the left with a horizontal speed u with respect to the state of the car before the jump. Thereafter, the other person jumps to the right, again with the same horizontal speed u with respect to the state of the car before his jump. Find the velocity of the car after both the persons have jumped off. Let the velocity of the railroad w.r.t. earth, when the man on the left jumps off be V.
0 = -mu + (M + m)V⇒ V= muM + m, towards rightWhen the man on the right jumps, his velocity w.r.t. the car is u. Figure shows a small block of mass m which is started with a speed v on the horizontal part of the bigger block of mass M placed on a horizontal floor. The curved part of the surface shown in semicircular. All the surfaces are frictionless. Find the speed of the bigger block when the smaller block reaches the point A of the surface. The mass of the small block is m.
Initial speed of this block is v.
The mass of the bigger block is M.
Initial speed of this block is zero. At point A, as the small block transfers its momentum to the bigger block, both the blocks move with a common velocity V (say) in the same direction as v.
In a typical Indian Bugghi (a luxury cart drawn by horses), a wooden plate is fixed on the rear on which one person can sit. A bugghi of mass 200 kg is moving at a speed of 10 km/h. As it overtakes a school boy walking at a speed of 4 km/h, the boy sits on the wooden plate. If the mass of the boy is 25 kg, what will be the plate. If the mass of the boy is 25 kg, what will be the new velocity of the bugghi? Consider the boy and the bugghi as a system. The total momentum before the process of sitting remains same after the process of sitting. A ball of mass 0.50 kg moving at a speed of 5.0 m/s collides with another ball of mass 1.0 kg. After the collision the balls stick together and remain motionless. What was the velocity of the 1.0 kg block before the collision? Let the velocity of this ball be v2 m/s. m1v1 + m2v2 = 00.5×5 + 1×v2 = 0⇒ v2 = -2.5 m/sHence, the velocity of second ball is 2.5 m/s, opposite to the direction of motion of the first ball. A 60 kg man skating with a speed of 10 m/s collides with a 40 kg skater at rest and they cling to each other. Find the loss of kinetic energy during the collision. Let the velocity of both men after collision be v.
v(t)=u1+t∆t(v1-u1)Find the speed of the second particle as a function of time during the collision. v(t)=u1+t∆t(v1-u1)Let v’ be the speed of the second particle, during collision. A bullet of mass m moving at a speed v hits a ball of mass M kept at rest. A small part having mass m breaks from the ball and sticks to the bullet. The remaining ball is found to move at a speed v1 in the direction of the bullet. Find the velocity of the bullet after the collision. The mass of bullet moving with speed v is m.
The mass of the ball is M and it is at rest. m’ is the fractional mass of the ball that sticks with the bullet. The remaining mass of the ball moves with the velocity v1. Let v2 be the final velocity of the bullet plus fractional mass system. A ball of mass m moving at a speed v makes a head-on collision with an identical ball at rest. The kinetic energy of the balls after the collision is three fourths of the original. Find the coefficient of restitution. The mass of the both balls is m.
Let the final velocities of balls be v1 and v2 respectively. A block of mass 2.0 kg moving 2.0 m/s collides head on with another block of equal mass kept at rest. (a) Find the maximum possible loss in kinetic energy due to the collision. (b) If he actual loss in kinetic energy is half of this maximum, find the coefficient of restitution. For maximum possible loss in kinetic energy, we assume that the collision is elastic and both the blocks move with same final velocity v (say). = 12m1v12 – 12m1+m2v= 12 × 2 × 22 – 12(2 + 2) × (1)2= 4 – 2 = 2 J (b) The actual loss in K.E. = Maximum loss in K.E.2 = 1 JLet the final velocities of the blocks be v1 and v2 respectively. The coefficient of restitution is e.
A particle of mass 100 g moving at an initial speed u collides with another particle of same mass kept initially at rest. If the total kinetic energy becomes 0.2 J after the collision, what could be the minimum and the maximum value of u. 12×0.1×u2 = 0.05 u2Let v1 and v2 be the final velocities of the first and second block respectively. ⇒ v1+v2=u …(1)(v1-v2) + e(u1-u2) = 0⇒eu = v2-v1 …(2) [Putting u2=0,u1=u]Adding the equations (1) and (2), we get: 2v2 = (1+e)u⇒v2 = u2(1+e)∴ v1 = u-u2(1+e) v1 = u2(1-e)According to given condition,12mv12 + 12mv22 = 0.2⇒ v12 + v22 = 4⇒ u221+e2 = 4⇒ u2 = 81+e2For maximum value of u, denominator should be minimum in the above equation. ⇒ u=22 m/sFor minimum value of u, denominator should have maximum value. Two friends A and B (each weighing 40 kg) are sitting on a frictionless platform some distance d apart. A rolls a ball of mass 4 kg on the platform towards B which B catches. Then B rolls the ball towards A and A catches it. The ball keeps on moving back and forth between A and B. The ball has a fixed speed of 5 m/s on the platform. (a) Find the speed of A after he catches the ball for the first time. (c) Find the speeds of A and B after the all has made 5 round trips and is held by A. (d) How many times can A roll the ball? (e) Where is the centre of mass of the system “A + B + ball” at the end of the nth trip? (a) Case-1: Total momentum of the man A and ball remains constant. (b) Case-2: When B catches the ball, the momentum between B and the ball remains constant. 5011m/s and the velocity of B will be 5 m/s. 6011i.e. > 5 m/s, it cannot catch the ball. Thus, A can only roll the ball six times. (e) Let the ball and the body A be at origin, in the initial position. A ball falls on the ground from a height of 2.0 m and rebounds up to a height of 1.5 m. Find the coefficient of restitution. Let the velocity of the ball falling from height h1 be u (when it approaches the ground). ⇒v= 2gh2 = 2×9.8×1.5Let the coefficient of restitution be e.
In a gamma decay process, the internal energy of a nucleus of mass M decreases, a gamma photon of energy E and linear momentum E/c is emitted and the nucleus recoils. Find the decrease in internal energy. Let the nucleus recoils with a velocity v.
Block A strikes the spring with a velocity of 1 m/s. After the collision, it’s velocity decreases continuously. At an instant the whole system (Block A + the compound spring + Block B) moves together with a common velocity V (say). As there is no external force acting in the horizontal direction, the momentum is conserved. A bullet of mass 20 g travelling horizontally with a speed of 500 m/s passes through a wooden block of mass 10.0 kg initially at rest on a level surface. The bullet emerges with a speed of 100 m/s and the block slides 20 cm on the surface before coming to rest. Find the friction coefficient between the block and the surface. 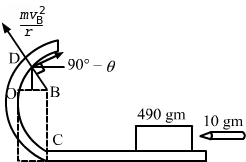 Distance covered by the block, d = 20 cm = 0.02 m .
A projectile is fired with a speed u at an angle θ above a horizontal field. The coefficient of restitution of collision between the projectile and the field is e. How far from the starting point, does the projectile makes its second collision with the field? When the projectile hits the ground for the first time, the velocity remains same i.e. u. The component of velocity parallel to ground, u cos θ should remain constant. However, the vertical component of the projectile undergoes a change after the collision. A ball falls on an inclined plane of inclination θ from a height h above the point of impact and makes a perfectly elastic collision. Where will it hit the plane again? The angle of inclination of the inclined plane is θ. A ball falls on the inclined plane from height h.
As the ball elastically rebounds, it recalls with the same velocity v0 at the same angle θ from the normal or y-axis. Let the ball strikes the incline second time at any point P, which is at a distance l from the origin along the incline. y = voyt + 12ayt2we may write:0 = v0 cos θ t – 12g cos θ t2where t is time of motion of the ball in air, as the ball moves from origin to point P.
As t≠ 0, the value of t is 2v0g. Solve the previous problem if the coefficient of restitution is e.
Use θ=45°, e=34 and h=5 m.
A ball falls on the inclined plane from a height (h) of 5 m.
v=2g×5=10 m/sThe ball makes an angle β with the horizontal, after the collision. The horizontal component of velocity, 10cos45° remains unchanged. Let the distance where the ball falls after the collision be L.
A block of mass 200 g is suspended through a vertical spring. The spring is stretched by 1.0 cm when the block is in equilibrium. A particle of mass 120 g is dropped on the block from a height of 45 cm. The particle sticks to the block after the impact. Find the maximum extension of the spring. According to question, as the block attains equilibrium, the spring is stretched by a distance, x = 1.00 cm = 0.01 m.
u = 2ghu = 2×10×0.45 = 9=3 m/sAfter the collision, let the velocity of the particle and the block be V.
V=0.12×30.32=98m/sLet the spring be stretched through an extra deflection of δ. A bullet of mass 25 g is fired horizontally into a ballistic pendulum of mass 5.0 kg and gets embedded in it. If the centre of the pendulum rises by a distance of 10 cm, find the speed of the bullet. Let the bullet strikes the pendulum with a velocity u. Let the final velocity be v.
12(M+m)v2 = (M+m)gh⇒ u2(201)2 = 2×10×0.1⇒ u = 201×2 = 280 m/sThe bullet strikes the pendulum with a velocity of 280 m/s. A bullet of mass 20 g moving horizontally at a speed of 300 m/s is fired into a wooden block of mass 500 g suspended by a long string. The bullet crosses the block and emerges on the other side. If the centre of mass of the block rises through a height of 20.0 cm, find the speed of the bullet as it emerges from the block. Let the bullet emerges out with velocity v.
Let the velocity of the block be v’. 0.02×300 = 0.5×2 + 0.02×v⇒ v = 6-10.02 = 50.02⇒ v = 250 m/sHence, the speed of the bullet as it emerges out from the block is 250 m/s. Two mass m1 and m2 are connected by a spring of spring constant k and are placed on a frictionless horizontal surface. Initially the spring is stretched through a distance x0 when the system is released from rest. Find the distance moved by the two masses before they again come to rest. It is given that two blocks of masses m1 and m2 are connected with a spring having spring constant k.
Initially the spring is stretched by a distance x0. Let the distance travelled by m1 be x1 (towards right), and that travelled by m2 be x2 towards left. Two blocks of masses m1 and m2 are connected by a spring of spring constant k. The block of mass m2 is given a sharp impulse so that it acquires a velocity v0 towards right. Find (a) the velocity of the centre of mass, (b) the maximum elongation that the spring will suffer. vcm = m1v1 + m2v2m1 + m2 ⇒vcm = m1×0 + m2×v0m1 + m2⇒vcm =m2v0m1 + m2(b) Let the maximum elongation in spring be x. The spring attains maximum elongation when velocities of both the blocks become equal to the velocity of centre of mass. Consider the situation of the previous problem. Suppose each of the blocks is pulled by a constant force F instead of any impulse. Find the maximum elongation that the spring will suffer and the distance moved by the two blocks in the process. It is given that the force on both the blocks is F.
Let x1 and x2 be the extensions of blocks m1 and m2 respectively. Equating the equations (1) and (2), we get:⇒(x1+x2) = 2Fk …(3)As the net external force on the system is zero, the centre of mass does not shift. Consider the situation of the previous problem. Suppose the block of mass m1 is pulled by a constant force F1 and the other block is pulled by a constant force F2. Find the maximum elongation that the spring will suffer. Let the acceleration produced in mass m1 be a1. a1 = F1-F2m1+m2Let the acceleration of mass m2 be a2. a2=F2-F1m1+m2Due to the force F2, the mass m1 experiences a pseudo forceâ€‹. ∴ Net force on m1 = F1 + m1a2F’ = F1 + m1×(F2 – F1)m1 + m2 = m1F1 + m2F1 + m1F2 – m1F1m1 + m2 = m2F1 + m1F2m1 + m2Similarly, mass m2 experiences a pseudo force due to force F1. F” = F2 + m2×(F1 – F2)m1 + m2 = m1F2 + m2F2 + m2F1 – m2F2m1 + m2 = m1F2 + m2F1m1 + m2Let m1 be displaced by a distance x1 and m2 be displaced by a distance â€‹x2. Consider a gravity-free hall in which an experimenter of mass 50 kg is resting on a 5 kg pillow, 8 ft above the floor of the hall. He pushes the pillow down so that it starts falling at a speed of 8 ft/s. The pillow makes a perfectly elastic collision with the floor, rebounds and reaches the experimenter’s head. Find the time elapsed in the process. V→pm = V→p – (-V→m) = V→p + V→m⇒ V→p = V→pm – V→mAs no external force acts on the system, the acceleration of centre of mass is zero and the velocity of centre of mass remains constant. The track shown is figure is frictionless. The block B of mass 2m is lying at rest and the block A or mass m is pushed along the track with some speed. The collision between A and B is perfectly elastic. With what velocity should the block A be started to get the sleeping man awakened? Let the initial velocity of block A be u1 and the final velocity of block A,when it reaches the block B be v1. ∴12mv12 – 12mu12 = mgh⇒v12 – u12 = 2gh⇒v1 = 2gh+u12 …(1)Let the block B just manages to reach the man’s head. i.e. the velocity of block B is zero at that point. 12×2m×(0)2 – 12×2m×v2 = mgh⇒ v=2ghTherefore, before the collision:Velocity of A, uA=v1Velocity of B, uB=0After the collision:Velocity of A, vA=v (say)Velocity of B, vB=2ghAs the collision is elastic, K.E. and momentum are conserved. 2.5ghto get the sleeping man awakened. A bullet of mass 10 g moving horizontally at a speed of 50√7 m/s strikes a block of mass 490 g kept on a frictionless track as shown in figure. The bullet remains inside the block and the system proceeds towards the semicircular track of radius 0.2 m. Where will the block strike the horizontal part after leaving the semicircular track? As the bullet gets embedded inside the block, this is an example of a perfectly inelastic collision. Let the final velocity of the system (block and bullet) be VA. When the block loses contact at D, the component mg acts on it. Let the velocity at D be vB. Two balls having masses m and 2m are fastened to two light strings of same length l. The other ends of the strings are fixed at O. The strings are kept in the same horizontal line and the system is released from rest. The collision between the balls is elastic. (a) Find the velocity of the balls just after their collision. (b) How high will the ball rise after the collision? Let the velocity of m be v; and the velocity of 2m be v‘. 12×mv2-12×m(0)2 = mgl⇒ v = 2glSimilarly, velocity of block having mass 2m will be,v’ = 2gl∴ v=v’=u (say)Let the velocities of m and 2m after the collision be v1 and v2 respectively. m×u-2mu=mv1+2mv2⇒ v1+2v2 = -u …(1)On applying collision formula, we get: v1-v2 = [(u-v)]=-2u …(2)Substracting equation 1 from 2, we get:3v2 = u⇒ v2 = u3 = 2gl3Substituting this value in equation (1), we get:v1-v2 = -2u⇒ v1= -2u+v2 = -2u+u3 = -53u=-53×2gl = -50gl3(b) Let the heights reached by balls 2m and m be h1 and h respectively. 12×2m×(0)2 – 12×2m×v22 = -2m×g×h1⇒ h1=l9Similarly,12×m×(0)2 – 12×mv12 = m×g×h2⇒12×50gl9 = g×h2⇒h2 = 25l9As h2 is more than 2l, the velocity at the highest point will not be zero. Also, the mass m will rise by a distance 2l. A uniform chain of mass M and length L is held vertically in such a way that its lower end just touches the horizontal floor. The chain is released from rest in this position. Any portion that strikes the floor comes to test. Assuming that the chain does not form a heap on the floor, calculate the force exerted by it on the floor when a length x has reached the floor. Given is a uniform chain of mass M and length L.
Let us consider a small element of chain at a distance x from the floor having length ‘dx‘. P=(dm)v=ML. dx2gxAccording to the given condition, the element comes to rest. W=ML(x)×g=MgxLThus, the total force exerted is given by. where W is the weight of chain below the element dx up to the floor. The blocks shown in figure have equal masses. The surface of A is smooth but that of B has a friction coefficient of 0.10 with the floor. Block A is moving at a speed of 10 m/s towards B which is kept at rest. Find the distance travelled by B if (a) the collision is perfectly elastic and (b) the collision is perfectly inelastic. The block B is kept at rest. Lets v1 and v2 be the velocities of A and B after collision respectively. (a) If the collision is perfectly elastic, linear momentum is conserved. m×u1+m×u2 = (m+m)×v⇒ m×10+m×0 = 2m×v⇒ v = 102 = 5m/sThe two blocks move together, sticking to each other. The friction coefficient between the horizontal surface and each of the block shown in figure is 0.20. The collision between the blocks is perfectly elastic. Find the separation between the two blocks when they come to rest. Let the velocity of 2 kg block, just before the collision be u1. ∴12m×u12-12m×(1)2 = -μ×mg×s ⇒ u1 = (1)2-2×0.20×10×0.16⇒ u1 = 0.6 m/sAs the collision is perfectly elastic, linear momentum is conserved. Let v1, v2 be the velocities of 2 kg and 4 kg blocks, just after collision. i.e. v1-v2 = +(u1-u2) =+(0.6-0)⇒v1-v2 = -0.6 …(2)Substracting equation (2) from (1), we get:3v2 = 1.2⇒ v2 = 0.4 m/s∴ v1 = -0.6+0.4 = -0.2 m/sLet the 2 kg block covers a distance of S1. 12×2×(0)2 + 12×2×(0.2)2 = -2×0.2×10×S1⇒ S1 = 1 cm.Let the 4 kg block covers a distance of S2. A block of mass m is placed on a triangular block of mass M, which in turn is placed on a horizontal surface as shown in figure. Assuming frictionless surfaces find the velocity of the triangular block when the smaller block reaches the bottom end. According to the question, the surface is frictionless. Thus, the block m will slide down the inclined plane of mass M.
The horizontal component of acceleration a1 is given by ax = g sin α cos α, for which the block M accelerates towards left. Let the left acceleration be a2. By the concept of centre of mass, we can say that the external force is zero in the horizontal direction. a= g sin α- a2 cos αLet the time taken by the block m to reach the bottom end be t.
vm=u=a2t=mg sin α cos αM+m 2ha sin α=2m2g2h sin2α co2α(M+m)2 a sin α1/2the system is left to itself. Assume that all the surface are frictionless. (a) Find the speed of the larger block when the smaller block is sliding on the vertical part. (b) Find the speed of the smaller mass when it breaks off the larger mass at height h. (c) Find the maximum height (from the ground) that the smaller mass ascends. (d) Show that the smaller mass will again land on the bigger one. Find the distance traversed by the bigger block during the time when the smaller block was in its flight under gravity. According to the question, mass m is given with a speed v over the larger mass M.
(a) When the smaller block travels on the vertical part, let the velocity of the bigger block be v1, towards left. mv=(M+m)v1⇒ v1=mvM+m(b) When the smaller block breaks off, let its resultant velocity be v2. Let us assume that the body rises to a height h1 over and above h.
Now, 12mvy2 = mgh1⇒ h1 = vy22g …(iii)∴Total height, H=h+h1⇒H = h+vy22g⇒H = h+Mv2(M+m)2g-h ⇒H=Mv2(M+m)2g(d) Because the smaller mass also has a horizontal component of velocity V1 at the time it breaks off from M (that has a velocity v1), the block m will again land on the block M.
A small block of superdense material has a mass of 3 × 1024kg. It is situated at a height h (much smaller than the earth’s radius) from where it falls on the earth’s surface. Find its speed when its height from the earth’s surface has reduce to to h/2. The mass of the earth is 6 × 1024kg. It is given that h is much lesser than the radius of the earth. Let Ve be the velocity of earth and Vb be the velocity of the block. Let the earth and the block be attracted by gravitational force. Thus, according to the conservation law of energy, the change in the gravitational potential energy will be the K.E. of block. As only the internal force acts in this system, the momentum is conserved. A body of mass m makes an elastic collision with another identical body at rest. Show that if the collision is not head-on, the bodies go at right angle to each other after the collision. According to the question, the collision of the two bodies of mass m is not head-on. Thus, the two bodies move in different directions. Let the velocity vectors of the two bodies after collision be v1 and v2. As the collision in the question is elastic, momentum is conserved. A small particle travelling with a velocity v collides elastically with a spherical body of equal mass and of radius r initially kept at rest. The centre of this spherical body is located a distance ρ(< r) away from the direction of motion of the particle. Find the final velocities of the two particles. It is given that the mass of both the bodies (small particle and spherical body) is same. Let the velocity of the particle be v.
We break the particle velocity into two components: v cosα (normal to the sphere) and v sinα (tangential to the sphere). =ρrHere, the collision occurs due to the component v cosα. After an elastic collision, bodies of same mass exchange their respective velocities. Thus, the spherical body will have a velocity v cosα, while the particle will not have any component of velocity in this direction. However, the tangential velocity of the particle v sinα will remain unaffected.